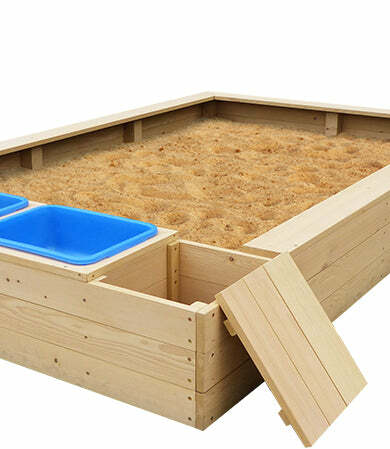 This Mighty Rectangular Sandpit has it all: a huge play area for little ones to get creative, play tubs for water, and storage compartments for toys and tools. The most exciting sand experience outdoors for your kids and their friends. With a large 1.9 x 1.25m sandpit area, your kids will have the freedom to let their imagination go wild! The perfect sized Mighty sandpit will be great for your kids and their friends to join in. Play tubs are super handy for sand play – you’ll be able to fill up tubs with water or other components to help sand castle building or general sand play easier. The Mighty comes with two corner storage compartments to store toys & tools. Hard wooden lids will cover to prevent any unwanted access such as pets or animals. 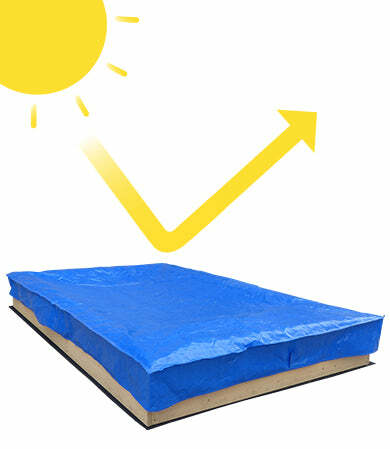 Our Sandpit comes with a UV-protected tarp as well as an internal ground sheet to prevent grass or weeds from growing into the sand play area, and also allows for water drainage.